Earlier this month, on the week of its release, Kentucky native Jesse Thomas's new album, War Dancer, debuted on Billboard’s Heatseeker’s chart at #25 and landed on iTunes’ Singer/Songwriter chart at #8. Not bad for someone who packed up her life and moved from Kentucky to Los Angeles in 2008 with hardly a penny to her name and nothing but her dreams of pursuing an acting career. But after boredom and a dusty guitar led her to a few open mic nights, Jesse's career turned in an unexpected way and instead of acting, she found herself signed to a record label. 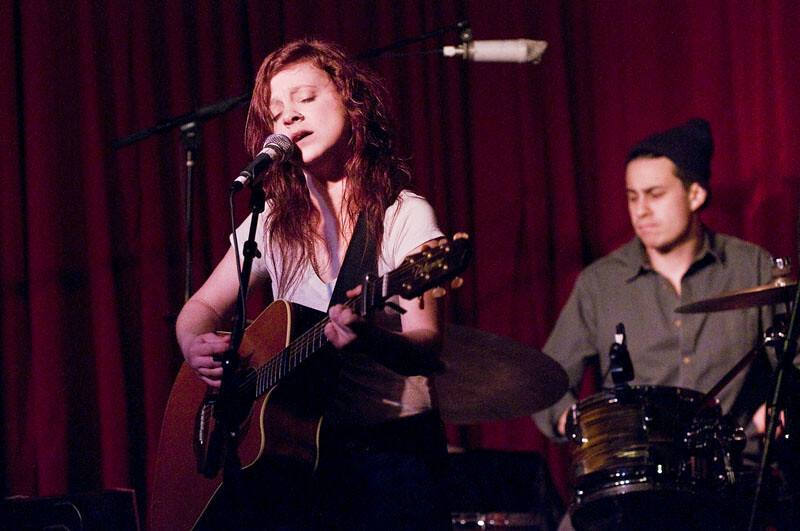 Four years later, Jesse had her debut album release party at the famed Hotel Cafe last Friday where she revved up her rustic vocals set to folk-scapes of vulnerable melodies of love and pain. Only in her early 20's, Jesse surprisingly has a voice that can only come through a lifetime's worth of heartache. One of the night's highlights was when she sang over spare piano keys in "Madeline," a slow burning folk-ballad, crooning of the pains of heartbreak. While during "Fire," she brought up fellow Red Parade label-mate JJ Worthen ( aka: Kingvolt) to accompany her raw, weathered vocals that wrapped around longing, acoustic guitar, proving that simplicity can hold the purest of emotions. It's not surprising why"Fire" was recently chosen as iTunes' Indie Spotlight of the Week. 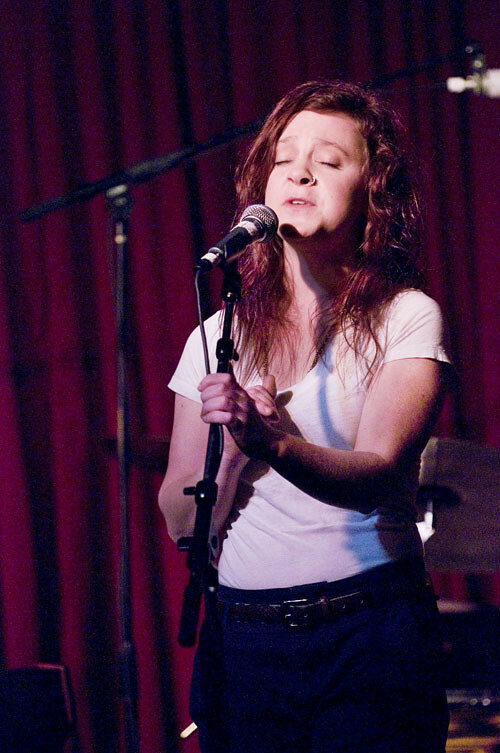 Jesse Thomas performs at Hotel Cafe. Playing with a full band complete with keyboardist and cellist, the night also had Jesse singing songs off her 2010 debut EP Hazel which was also a top ten chart topper and helped Jesse being chosen as one of Starbucks' featured artist of the week. In the catchy "You I Want," Jesse sings of the games we all play when trying to find love, "Why don't you say what you're thinking? / The looks that you give are deceiving / Break down your walls for the evening / What do you say?" She ended the night with a cover of the Beatles' "Come Together," fittingly in a night where close family and friends came together to share and celebrate the culmination of Jesse's four years of hard work. In two weeks (Mar. 15 & Mar. 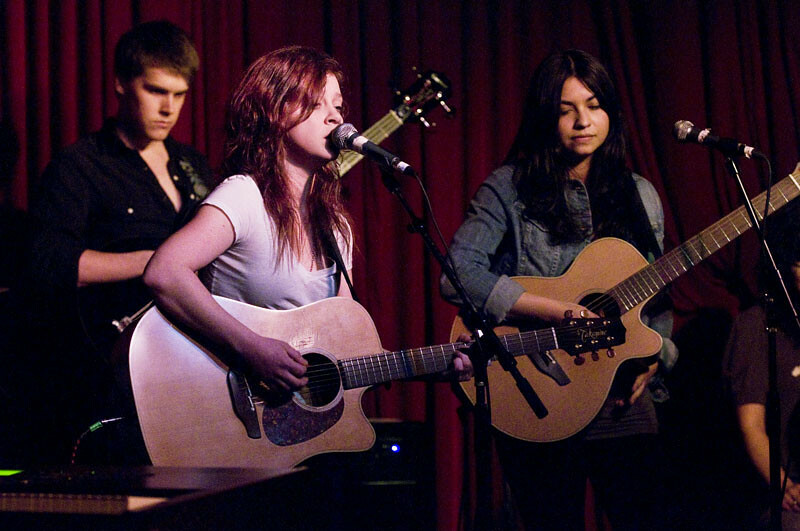 17) , Jesse returns to play at SXSW and then comes back to Los Angeles for her residency at The Hotel Cafe. QUEEN CAVEAT GETS A "SLAP ON THE WRIST"